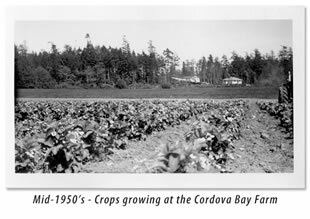 Don Galey purchased 50 acres of farm land in the late 1930’s and he became the 9th permanent resident of Cordova Bay. The farm began as a small dairy, and Don delivered milk by horse and wagon. After clearing land by hand, they started to grow crops in the late 1940’s. And they weren't alone; from the late 1800’s through to the 1960’s, Saanich had upwards of 100 farms. Today, there are only a handful. In the 1960’s, Don and Mary sold the dairy and started an egg farm. 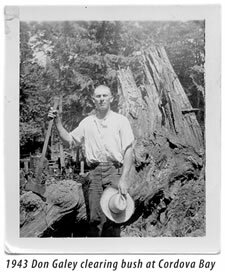 In 1985, Ray and Gordon Galey moved the farm from Cordova Bay to the beautiful Blenkinsop Valley. Galey Farms now grows thousands of tons of produce annually for the people of Vancouver Island, on 150 acres at several Victoria area locations as well as the Blenkinsop Valley. The future of farming depends on people who support local sustainable agriculture. Education is the key to success! In 2000, Galey Farms expanded its operation to include agri-tourism to increase viability and to educate the public on how their food is grown and why farming is important to a community. Through the addition of a train, we are able to move people around the entire farm while talking about what we do, how we do it and why a viable food producing farm will continue to be an asset to their community in the future. Although the topics are serious: food sustainability, food safety, and sustainable environmental practices, we hope that by making learning fun and sometimes entertaining, our visitors will leave with an understanding that local agriculture is necessary in a world that only appears to have an abundance of food.